Ghanaian born British fashion designer Ozwald Boateng & Nigerian Oil tycoon Kola Aluko last week launched the African50 initiative. The platform is an African infrastructure project development fund which was formed as a result of the joint venture between the African Development Bank (AfDB) and the Made In Africa Foundation (MIAF; a non-profit organisation founded by Ozwald Boateng & Kola Aluko). The initiative is set out to provide a catalyst for African development and growth by focusing on commercially viable infrastructure projects in Africa. “Infrastructure drives growth. If we focus on the big infrastructure projects- power, good roads, railways – then we will be creating an enabling environment for entrepreneurs in other areas of endeavor which are non-infrastructure,” Aluko said in the online broadcast. Re-emphasizing the need for such an investment, Ozwald reiterated that Africa could not properly compete without the infrastructure that would drive trade. “Clearly as Africans to compete we need the roads and rail, telecommunications and urban environments that stimulate and ensure trade,” Boateng said in a statement. So far, the cause has raised about $250 million; Aluko and the AfDB have contributed $50 million each to the fund. In conjunction with the AfDb, MIAF is determined to attract investments from development finance institutions, pension funds, sovereign wealth funds and governments towards reaching the funds goal of $500 million by the first half of 2014. The money will be used to fund feasibility studies of large-scale infrastructure projects. 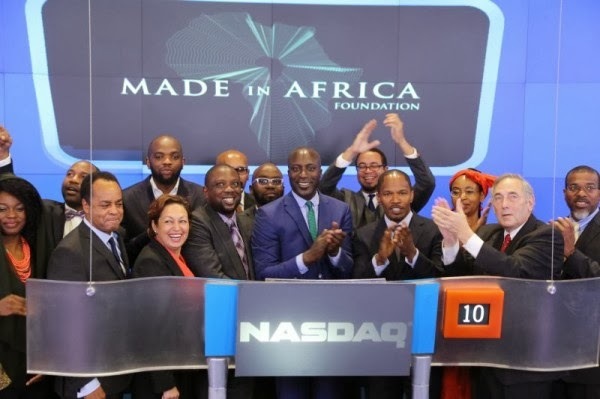 Made In Africa is also planning to raise a $10 billion project finance fund. Oscar winning actor Jamie Fox, who is a fanatic of Ozwald’s designs was present at the launch. The official launch took place at the NASDAQ in New York. For more information visit Forbes.com.